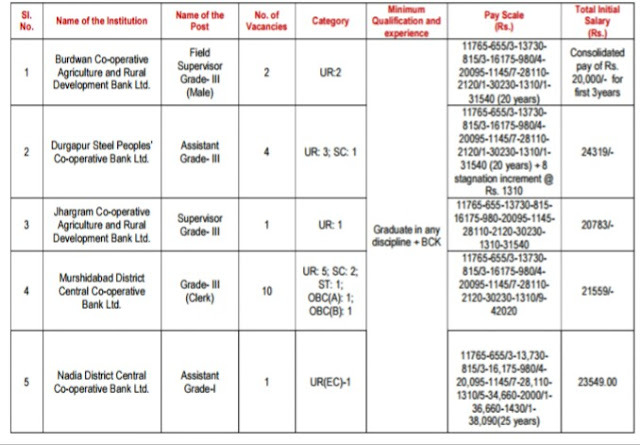 The West Bengal Cooperative Service Commission, Has Published A Recruitment Notification For Various Posts, So Eligible & Interested Candidates Can Apply For This Job Within The Last Date. Kindly Do Check Out The Official Notification For More Information On This Job, It's Given Below. A. Number Of Vacancies & Name Of The Posts (Advertisement No. 01/2019). Five Different Posts Vacancies Under This Notification (Check Out The Image Below) →18 Vacancies. Total Number Of Vacancies →18 Vacancies. B. Eligible Criteria For This Job Of West Bengal Cooperative Service Commission 2019. Mode Of Examination/Selection Process →Written Exam/Practical Test/Interview. Online Application/Examination Fee →₹160+ 40 Processing Fee For General/OBC Candidates And ₹40 For Other Reserved Candidates. For More Information →Visit The Official Website Here>The Official Website. Do Visit Here Regularly For More Job In West Bengal And More, Till Then Stay Safe And Blessed.